This is one of the most unusual contextual images I have taken in East Africa in the last few years. The white of the flowering meadows and the white of the summit of Kilimanjaro combine to give the image an ethereal glow. The extreme weather conditions - it had rained torrentially for four or five days - had resulted in an implausible theatre of dreams. There was more snow on Kilimanjaro than I have ever seen before and the normal arid dustbowl of Amboseli was a garden bursting into acres of white carpet. For anyone that knows this area, the combination of whites provokes a degree of visual disquietude. It was quite a remarkable sight that was all down to the freak weather. The biblical rainfall had discouraged almost any other visitors and we had the amphitheatre to ourselves. We also had a film permit which allowed us to go off road - albeit the ground was very saturated and we were getting stuck regularly - we needed two vehicles to be safe. The bigger problem was that there were very few elephants in the park - the rain had pushed them out of the park and into the forests below Kilimanjaro. I knew, however, that in the vicinity of the KWS Rangers’ HQ, there are always a good number of big elephants hanging around as they feel safe. It was here that we spent much of our time this March - despite it being a 90 minute drive from our base. As soon as I saw the white meadows, I knew we had the chance of an image that offered a story of both lyrical grace and beauty - especially if the cloud lifted and we were exposed for a few brief minutes to the summit of Africa’s tallest mountain. Then we just needed the elephants and this was the X factor. No elephant - no party. About 5 pm on one unforgettable evening, everything came together as a small group of elephants headed to the foothills for the night and in so doing walked right through the white meadows. Getting in the right place for the composition was a fairly intense 10 minutes - I knew that this was a moment in time and I would not forgive myself if we missed it. 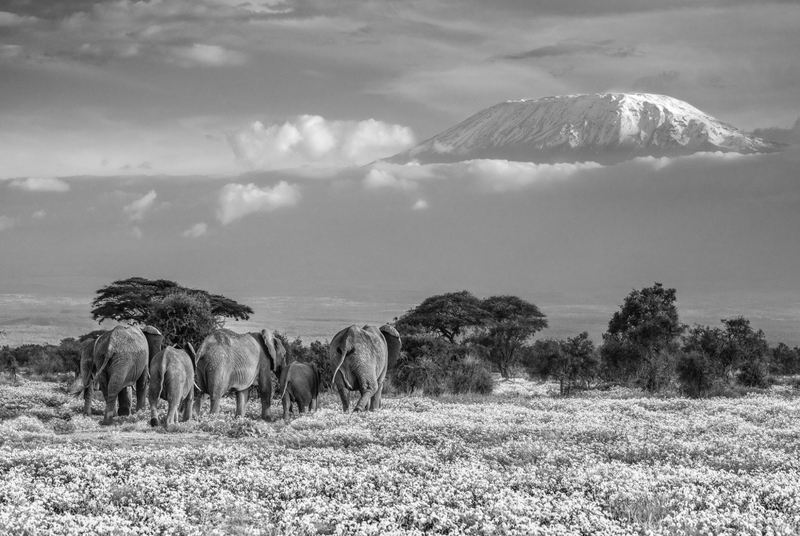 I look at this picture a great deal and wonder whether it would be better if the elephants had been coming away from Kilimanjaro rather than moving towards it? We will never know, but the formation of the herd has a nice diagonal shape and it tells a story of a journey unaffected by my presence. I think the anonymity of the individual elephants helps focus on the wider context - which is really a hallmark of some sort of fantasy. Was this what The Garden of Eden looked like? Who knows, but it does have a virginal feel.